Reaching the age of 10 years is always a major and unique event in the life of a band. It is a very special moment that invites you to look on back on the past and admire the long way you've come. 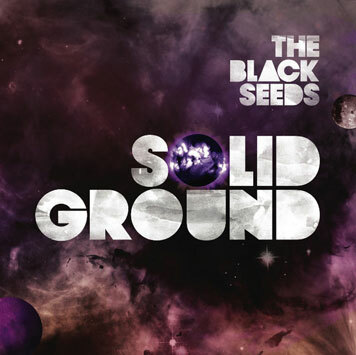 THE BLACK SEEDS are celebrating this very special birthday with Solid Ground, the best album they ever released. In ten years the 8 piece roots/dub/funk outfit hailing from the coastal capital of Wellington, New Zealand has matured to become one of the major pacifasian music bands. In 2001 the band lead by singer/writer BARNABY WEIR recorded the critically acclaimed and gold-selling debut album Keep On Pushing. They kept on turning heads around with their second album On The Sun released in 2004. With its 2 hit singles So True and Turn It Around being on heavy rotation on all the national radios and music televisions On The Sun achieved double platinum sales at home and helped solidifying THE BLACK SEEDS' status as one of New Zealand's premier groups. They exposed internationally their pacific vibe and their feel good, reggified and sunkissed grooves with Into The Dojo released in 2007 on Sonar Kollektiv. To support the release of their third album THE BLACK SEEDS completed a very successful 18-show European tour in July/August 2007 that included sell-out shows in London (Mean Fiddler), the Edinburgh Festival (3 shows), Berlin (2 shows), a standout performance at the famous Lowlands Festival in Holland (70,000 strong), a live performance on the BBC's CRAIG CHARLES Funk and Soul Show, as well as strong attendances in many other venues across the UK, France, Germany and Holland. With such an extensive local and international touring over the past years the members of THE BLACK SEEDS have never been so close to each other. This closeness has had a great influence upon the band, his evolution and upon the creative process of their fourth studio-album Solid Ground, in which everybody has been constantly involved. Moreover founding values such authenticity and integrity never left the creative spirits of all the members of the SEEDS after all these years. The result is an album showing more creative maturity and more conscious experimentation. As BARNABY WEIR puts it „THE BLACK SEEDS are a tight. (... ) We have set a solid foundation for the band over 10 years (... ) and with Solid Ground we've been experimenting with some new flavours and directions. (... ) I believe we have all got better at what we do individually and together and have created some exciting new songs." Recorded again at The Surgery Studio with DR LEE PREBBLE and produced by MIKE FABULOUS, Solid Ground is a real masterpiece fusing infectious dub-reggae grooves, melodies and party jams with raw, uncompromising and undiluted conscious roots music. Once again a great importance has been placed on remaining true to who they are and where they are from - from the expansive green landscapes and coastlines of New Zealand and the South pacific, to the urban community of their home city Wellington. With Solid Ground THE BLACK SEEDS aim for the truth in twelves gems made of dub, funk, afrobeat and soul, with a vintage reggae base. Crossing genre boundaries in only a way THE BLACK SEEDS can, Solid Ground oozes with the bands distinctive flavour – from the heavy-hitting karma-inspired first single Slingshot, to darker reggae/dub-infused tracks like Send a Message &The Bubble, infectious reggae gems like Love Is A Radiation, Come To Me and Bulletproof, and the funk/soul filled - Rotten Apple and AfroPhone. Once again every song conveys very deep feelings and very strong messages: Personal triumphs and failures, the fear of Love, death and apathy, relationships - good and bad, personal stories and insights into their lives in a multi-cultural, modern nation. But, ultimately every song is underpined with a positive and optimistic undertone, even when confronting hard truths or lessons learnt. This year again THE BLACK SEEDS will be performing all over Europe and presenting Solid Ground in all the biggest festivals such as The Lovebox Weekender (featuring the FLAMING LIPS, MANU CHAO, GROOVE ARMADA) and Rip Curl Boardmasters Festival in the UK, Roskilde in Denmark (featuring RADIOHEAD, KINGS OF LEON, etc); the Summerjam and Splash Festivals in Germany (JAY Z, COMMON, STEVEN MARLEY); the Garance Festival in France and many more. So don't stay aside and come enjoy the solid grooves and fresh irie sounds of THE BLACK SEEDS!